Prepare the rice per instructions. Heat the olive oil in a skillet over medium heat. Once the pan is hot, add the mushrooms then leave them alone for 3-4 minutes before flipping them with a spatula; add the shallots and cook, stirring often, for 2-3 minutes. Add the butter and soy sauce to the pan and cook, stirring constantly, for 1 minute. 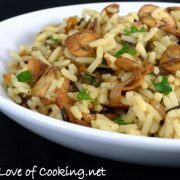 Once the rice has finished cooking, mix in the mushroom mixture and most of the parsley then gently fluff with a fork to combine the mixture. Sprinkle the top with the last bit of parsley. Serve immediately. Enjoy.